Hockey is a game of matchups, and at no time are those matchups magnified with a greater lens than in the postseason. The coach with home ice advantage gets control of those matchups, as they have last change and the choice of who they want to put on the ice after the road team has made their selections. In this series, the Calgary Flames will have the home ice advantage in four of the potential seven games, so a lot of the matchups, particularly early in the series, will be dictated by their coach, Bill Peters. Let’s take a look at some of the most important matchups to watch in this series within each game. A lot will be made about the matchup between both teams’ stars, Nathan MacKinnon and the Flames Johnny Gaudreau, but it would be a surprise if Peters matched his star against Colorado’s. Instead, he is likely to match Swedish center Mikael Backlund up against MacKinnon in hopes of slowing the Avs superstar down and freeing up Gaudreau’s line offensively. Backlund, one of the more underrated players in the NHL, plays a very similar role to that of Carl Soderberg, but has proven to be more consistent over the years. He has generally controlled the majority of shot attempts when on the ice, as the Flames owned 55.34% of the shots this year when Backlund was out there. 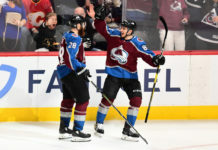 He has managed to somewhat slow MacKinnon down in the past, as the Avs center has four even strength points in the last six games against the Flames. Backlund has 11 points in those sox games and has managed a gaudy +11, so he’s a threat on the offensive end as well. 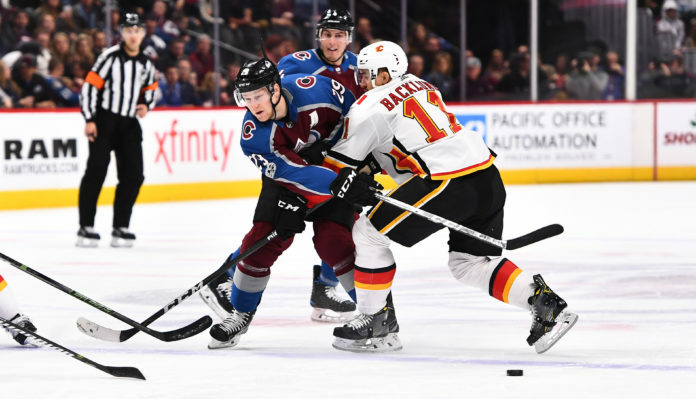 While the playoffs typically come down to how stars compete against each other, how MacKinnon fares matched up against Backlund will go a long way in determining how much of a fight the Avs can put up. The 25-year old Flames forward is the Avs equivalent to MacKinnon, finishing the year with an equal 99 points. He picked up four points in the three games against the Avs this year, but last season picked up zero points in all the games against the Colorado. As a left winger, he will line up directly against Johnson, the right defender. Several leg injuries over the years have appeared to slow Johnson’s mobility this season, so he’s going to have to prove he can keep up with the elusive Gaudreau. Johnson’s partner, Samuel Girard, may actually be a better match for Gaudreau’s skating, but he’ll be on the other side of the ice. Ultimately, Johnson will have to find a way to use his size and reach to help take time and space away from Gaudreau. There’s no love loss between these two players, that’s for sure. Last season, Landeskog was suspended four games for cross checking the feisty Tkachuk in the face. Both of these players are the heart beats of their teams emotionally, as they tend to set the tone physically, while also providing a lot of offense. Avs fans should know the name Tkachuk well, as Matthew’s father Keith had playoff battles in the past with Adam Foote. If they don’t know who Tkachuk is, they’ll find out immediately and love to hate him. He gets under the opposing team’s skin and enjoys doing so. L.A. Kings defenseman Drew Doughty recently said that he has “no respect” for Tkachuk, and that didn’t seem to bother the young winger much. Landeskog will be responsible for keeping him in check physically, while also having to hold himself (and his teammates) back from retaliating. Since Tkachuk plays on a line with Backlund, and Landeskog will be paired up with MacKinnon, these two will likely see a whole lot of each other over the next two weeks. 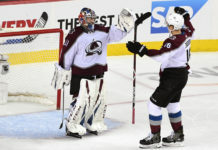 Avalanche head coach Jared Bednar has yet to make his starting goaltender clear even though the series kicks off on Thursday evening, but there is no doubt it will be summer acquisition Philipp Grubauer. The 27-year old German was perhaps the biggest reason the Avs were able to sneak into the playoffs, going 8-1-2 in his last 11 starts and putting up video game numbers in net. 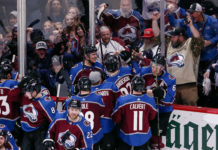 It was a far cry from the goalie Avs fans saw most of the season, who struggled to track the puck and couldn’t put together a solid string of games. The Avs will need him to keep up his play against the Flames, who were the second-highest scoring team in the league. If there is any position the Avs should have an advantage in, it’s in net. The Flames have two goaltenders and don’t seem terribly comfortable with either. David Rittich put up much better numbers during the regular season, but it would appear the Flames might start the series with veteran Mike Smith in net. The 37-year old put up a very poor .898 save percentage this season in 40 starts, but managed to win 23 games because of the offense in front of him. Even if Smith starts the series, it shouldn’t be a surprise if the Avs see Rittich at some point, as neither has taken control of the net. Either way, goaltending has proven to be the ultimate x-factor in the playoffs year after year, and right now, the Avs might have the hottest goalie in the league on their side. Stay tuned to Mile High Sports for more coverage of the series as the week goes on.